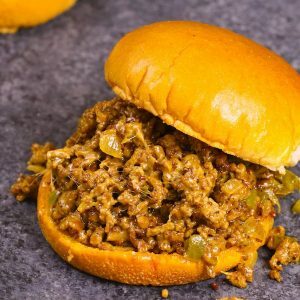 These Philly Cheese Steak Sloppy Joes combine your favorite Philly Cheesesteak and Sloppy Joe recipes into one irresistible meal. And they’ll be on your dinner table in less than 30 minutes. Plus video recipe tutorial! 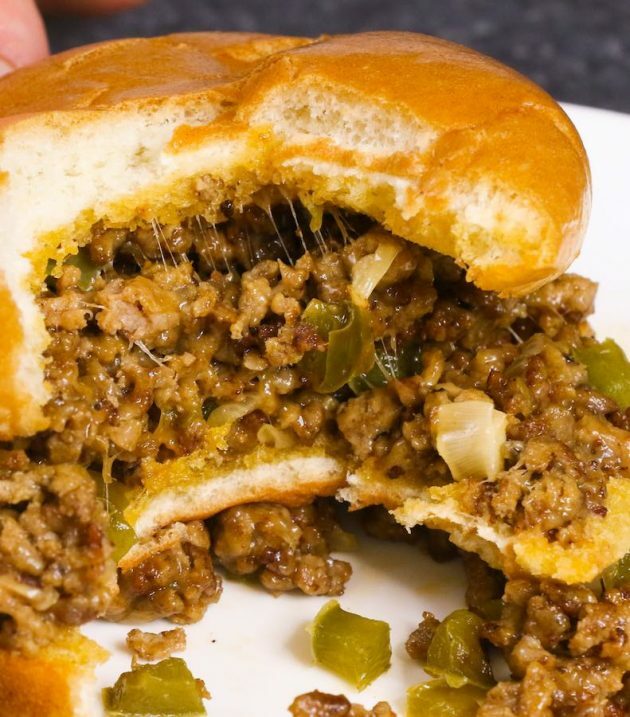 This recipe combines two classics in one recipe: the Philly Cheesesteak and Sloppy Joes! 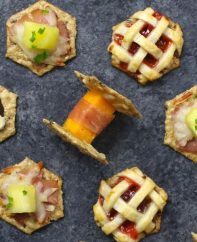 They’re so delicious and sure to please your family and friends with the mouthwatering cheesy, sweet and savory flavor in each bite. Totally irresistible! 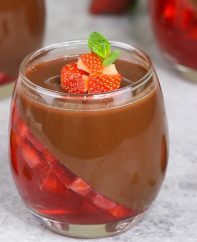 This recipe video got more than 10 million views on Facebook! These Philly Cheese Steak Sloppy Joes are quick and easy to make, and popular with both adults and kids. It’s one of my favorite dinner ideas, along with Taco Pasta, Party Lasagna, Beef Stew, Honey Garlic Chicken, Mongolian Beef, Cuban Sandwiches and Teriyaki Chicken. Philly Cheese Steak Sloppy Joes recipe combines both Philly Cheese Steak and Sloppy Joes recipes. Sloppy Joes originated in 1930s in Sioux City, Iowa, where the “loose” meat sandwiches were sold by a cook named Joe. 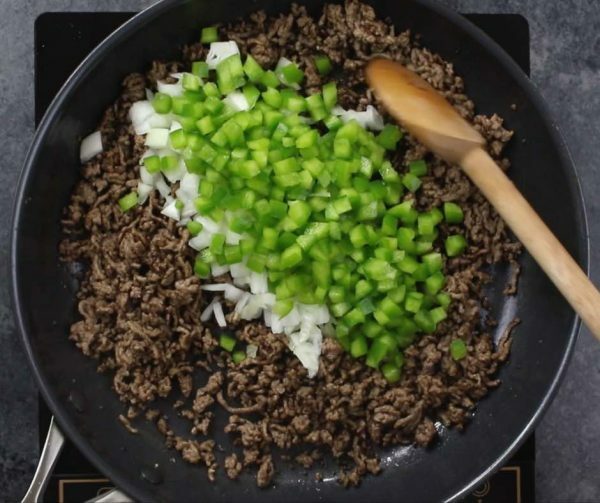 Instead of the regular patty or flat cake of minced meat, Sloppy Joes are filled with loose ground beef with diced onions, green bell peppers and melted cheese. Philly Cheese Steak or Cheesesteak is a civic icon in Philadelphia, and it was invented by a hot dog vendor Pat Olivieri in South Philadelphia. 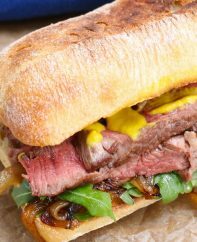 It is a sandwich made with thinly sliced sautéed rib eye beef and melted cheese in a long, crusty roll. The top choices of the cheese are Cheez Whiz, American or provolone cheese. Philly Cheesesteak has a reputation as being a satisfying hearty meal. To make the Philly Cheesesteak I used beef, onions, green pepper, provolone and a homemade cheesesteak sauce. Step 1: Brown the Ground Beef and Vegetables. Place a cast iron skillet over medium-high heat and coat with oil. 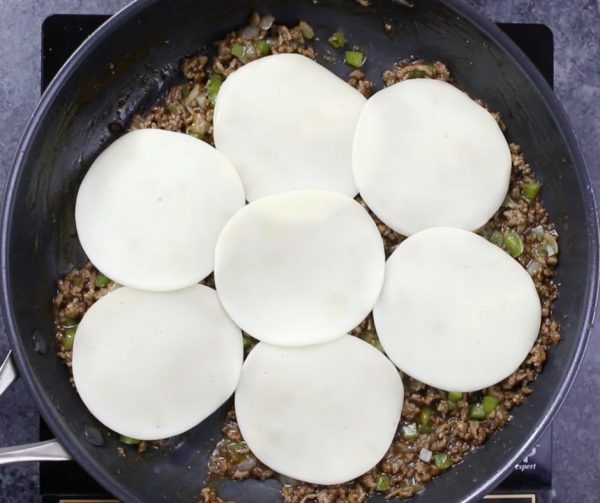 Add the ground beef and break it up to prevent it from clumping. Cook for about 5 minutes until the the beef is no longer pink. Stir in diced onions and green bell pepper. Cooke for about 2 to 3 minutes until the onions are translucent. Drain off any fat that accumulates. Note: A large skillet works better to brown the ground beef when it’s not too crowded. Or you can make two batches if your skillet is not big enough. Add in the beef broth followed by the ketchup, Worchester sauce, salt and pepper. Do a quick taste-test and add more ketchup or salt according to your personal taste. Then in a small bowl or cup, mix cornstarch with a tablespoon of water, and add to the pan, stirring constantly. Cook for a few minutes until the mixture is thick enough to start forming mounds. Note: Make sure NOT to dry out all the sauce. The best sloppy joes have a thick but moist consistency. So cook your mixture until it’s still has about 10% to 15% liquid. Step 3: Add in the Cheese. The next step is adding the cheese to the pan. This is a good time to start toasting your buns because these sloppy joes are almost ready! Remove your skillet from heat, add cheese and slowly stir it in. The hot mixture will melt your cheese very nicely. Butter and toast your buns, and scoop the beef mixture on top of each bottom buns and cover with the remaining bun halves. Serve and enjoy! Note: You can toast your buns under broiler or bake the assembled buns for a few minutes. The toasting and baking process will prevent your buns from getting too soggy. 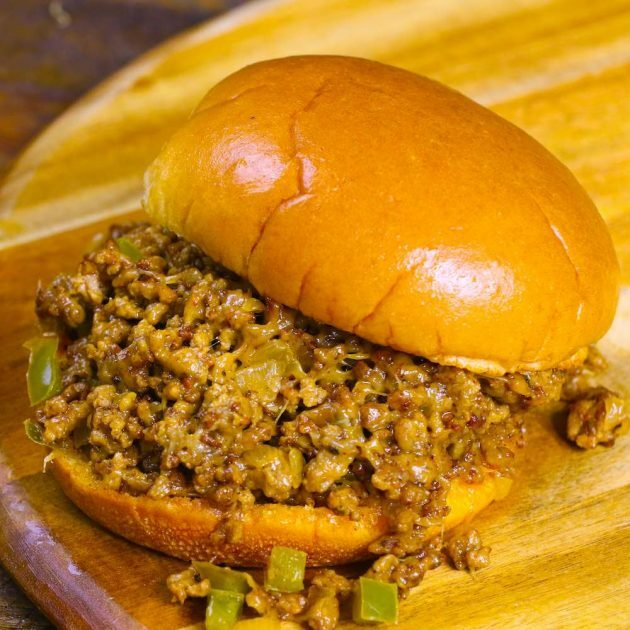 Another tip is to add butter to your buns and it will give your sloppy joes extra delicious flavor. 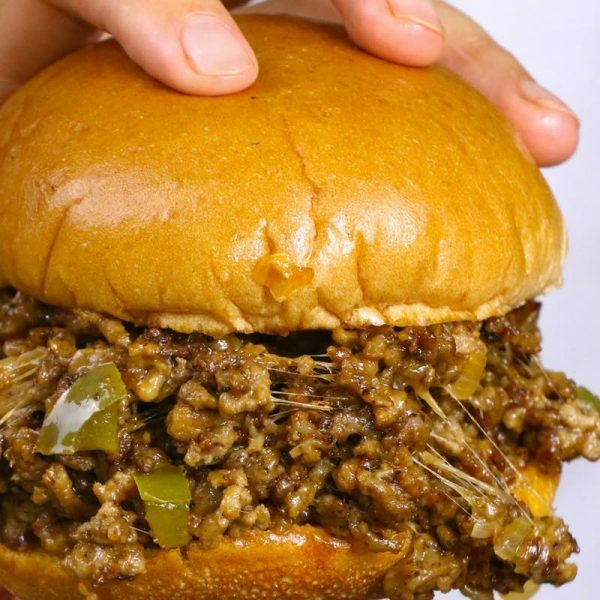 Serve these Philly Cheese Steak Sloppy Joes on the buttered and toasted soft buns, and they taste out-of-this world delicious. This is the traditional way of serving Sloppy Joes. You can substitute the buns for burrito wraps or tortillas. You can also serve the Philly Cheese Steak Sloppy Joes beef mixture with rice, baked potatoes or pasta. Consider adding pickles, chips, fries or potato salad on the side. Adding some beers will make it perfect for a game day meal. 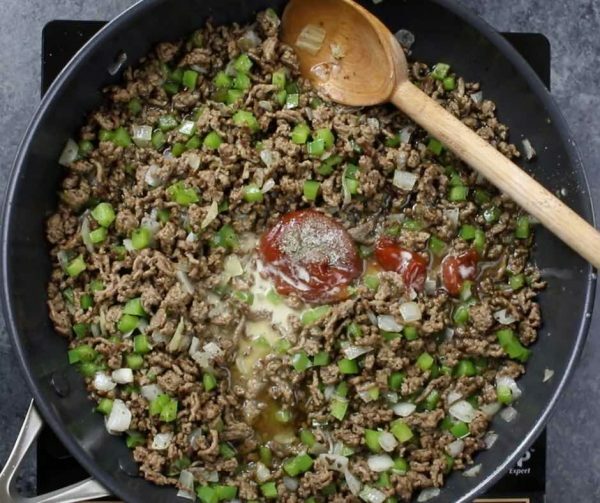 Use a large skillet to brown your ground beef so it’s not too crowded. If your skillet is not big enough, you can brown the meat in two batches. To get the maximum flavor, it’s better to cook the beef until it forms a deep brown crust. If you use regular ground beef (fatter than 90% lean beef), you would need to strain out the fat after you brown the beef. 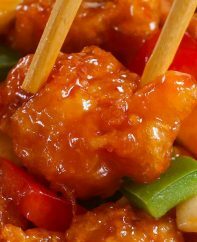 After you add all the sauce ingredients to the meat mixture, a quick taste-test would give you the best flavor that just tailors for your family. Adjust the seasoning according to your preference. After adding the cornstarch and water mix, don’t dry out the sauce. The best sloppy joes should have a thick but moist consistency. Make sure to toast your buns to prevent them from getting too soggy. 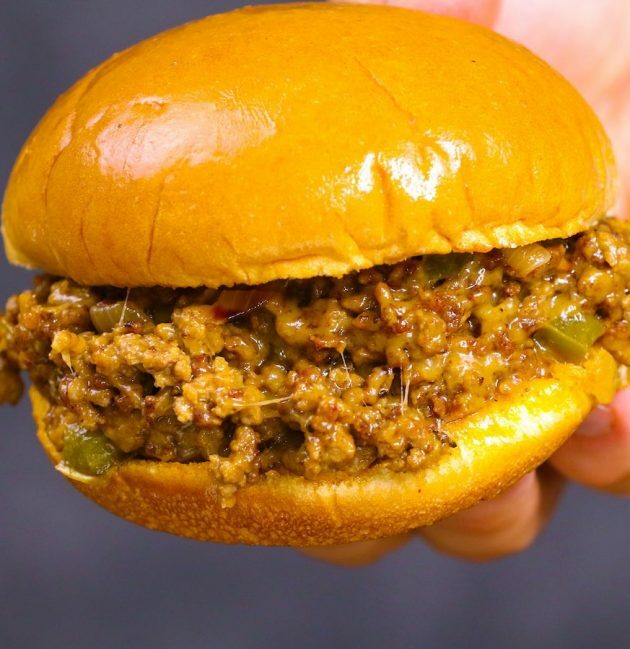 Buttering your buns will make your sloppy joes extra delicious. If you decide to broil or bake your buns with the beef mixture. You don’t have to mix the cheese into the beef. You can top your sloppy joes with your favorite cheese and bake them all in the oven. 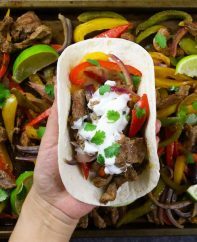 If you plan to make this recipe for a party or dinner the next day, you can cook the beef, onion and bell pepper, then add all the other ingredients except the cheese and buns. Let the mixture cool down and store it in the fridge. When you are ready, just heat the mixture up and follow the rest of the steps. 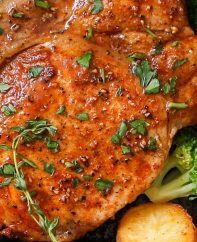 Worcestershire Sauce: it is an important ingredient and adds great flavor to this recipe. Try not to substitute it with soy sauce. Feel free to use low sodium Worcestershire sauce to reduce the sodium intake. Provolone Cheese: I used sliced provolone cheese, but you can use Cheez Whiz, American or Cheddar instead. Vegetables: I used diced onions and green bell pepper. 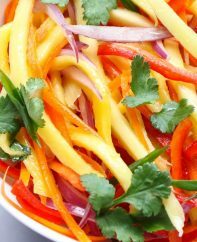 Feel free to add more vegetables such as mushrooms, and they add great flavor to this recipe. Ketchup: Ketchup has its own flavor and adds more sweetness to the sauce. Beef Broth: I used Cambell’s beef broth and it works well for this recipe. These delectable Philly Cheese Steak Sloppy Joes combine your favorite Philly Cheesesteak and Sloppy Joes recipes into one irresistible meal. And they’ll be on your dinner table in less than 30 minutes. Place a large nonstick pan or cast iron skillet over medium-high heat. Editor Note: Post updated 2/26/2018 with additional information. This sounds yummy! I always keep shredded beef on hand made from cooking chuck roast & dry onion soup mix in the crock pot. I made this tonight! Aside from not even tasting the ketchup and W sauce (not very sloppy joe-ish) and needing to add a bit more corn starch to finish thickening, it was pretty tasty! A great go-to for a quick meal. Thanks for your feedback and glad it worked out ? I’m glad I read this. I needed to add corn starch also. Otherwise it was fine and tasted good. Agreed. Had to add more cornstarch. But I could smell the worcestershire sauce as soon as I added it. I haven’t made this, but was thinking I would use tomato paste to thicken instead of corn starch. Whipped this up tonight and we really liked it a lot. I did use closer to 2tbsp of cornstarch to thicken. I also put a slice of swiss on my Sammich, and loved the flavor. Probably going to 1/2 provolone 1/2 swiss next time. ?????????? I made this last night and they were delicious, only problem was it was too watery. I followed the directions and would make again, but next time use 1/2 the amount of beef broth. I had the same issue. Used more cornstarch but it was still too runny. Ended up adding another pound of browned hamburger to it. Probably should have added more ketchup and Worcestershire sauce. Made this for supper last night. It was delicious even though I forgot to add in the cornstarch. I was wondering the same thing. For me, the need for a sub is because I’m allergic to fish, and most Worcestershire sauce uses sardines or anchovies as a flavoring additive. 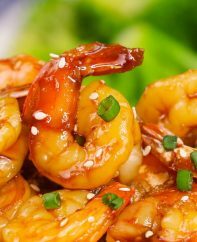 You may want to try tamarind vinegar and soy to get the full flavor. I use tamarind paste alot. Made it an was very good. Will make again. Omitted cornstarch an I didn’t drain skimmed off grease an left juice. Also omitted beef broth. What can you substitute for the cornstarch – I don’t have it on hand? Hi Mickie, All-purpose flour is the best substitute. If you premix it 1:1 with water using a fork or whisk, you won’t have any lumps. Hope that helps! You can use worchestersire in chip beef gravy over toast(awesome) I also use it on my steak, love the taste? I use Worcestershire sauce in my meatloaf; I can’t imagine it without it. Is the nutrition facts including the bun? Made this last night while I’m away from my home. Didn’t have cornstarch or flour. Used a packet of Mcormac’s brown gravy mix . Didn’t have to use any thickening and it was perfect and easy. Will definitely make again. Made it and it was delicious. Can this be made in a crock pot instead? I am making it for a family get together. Brown the hamburger before putting in the crockpot. Can I make this in a crock pot instead? I am making it for a family get together. Made this tonight. Added I T more if cornstarch was just right. Very good but next time I’d do 3 or 4 slices of cheese not 6 way to much cheese. Is there such a thing as too much cheese??? ? Is there a substitute for ketchup for those allergic to tomatoes? I am trying this tonight for supper, but I don’t understand why you need to oil at the beginning, and I don’t understand why there needs to be a cup of beef broth that you then have to take it. I am going to try mostly leaving that out. Could this be done with ground turkey instead of beef? I have made this many times. And I have used Cheeses Wiz Like the do on real Philly steak in Philly. Great Recipe thank you so much for sharing. Trying it tonight but I’m using ground chicken like philly chicken sandwiches. I find subbing the ground meats with turkey or chicken ground make little difference if that’s what you’re used to. Go Eagles! This was delicious!! Big hit, even with my very picky husband!! I didn’t have beef broth, but I had some beef au jous in a jar and it worked great! Definitely a go to recipe for now on!!! The original Philly Cheese Steak sandwiches are made with shaved beef, onions, salt, pepper and white American cheese and sometimes a little marinara sauce on request. That is all! No peppers or anything else. Go to South Street in Phi lly and check it out. I made this plant based!! Instead of using ground beef, I used Bova veggie crumbles. Instead of provolone cheese, I used Vegan/dairy-free cheese. I added mushrooms and instead of any oil, I used a little vegetable broth to sauté the vegetables. No need to add any additional broth or cornstarch. It was amazing!! Will definitely make again!! ??? I made this for dinner tonight and my family ate the whole thing! 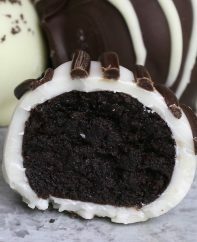 Not one bite left! I thought it was very good as well. I had to do 3 table spoons of corn starch instead of one but nonetheless it was amazing! Delish! Making again tonight, this time without the ketchup, WS, & cutting broth in half. Family loved it! I ended up using a 2:2 ratio. Two(2) tbsp. Cornstarch to two(2)tbsp water. Made this and the family loved it I made my own beef broth and I doubled every thing I was concerned it mighty effect the flavor but if It did we didn’t notice ! Defiantly more of a sloppy joe flavor which is not what I had hoped this recipe would be initially but it turned out well and I would defiently do it again. I didn’t have to adjust the corn starch once it started to cool it thickened right up. I liked these! By the way, is it possible to substitute this recipe with ground turkey? My fiance and i loved this. It came out a little “sloppy”. Lol. Yes. So next time i will lessen the broth or use 2:2 ratio on cornstarch. Plenty of leftovers for drowning some fries with. I also only used 3 pieces of cheese! Amazing. Added to my recipe book! Just made this tonight I agree maybe double the cornstarch but I did half of pound of cheese as I love cheese and it thickened it. “It is a keeper” is what my family said. It was easy and delish and definitely not to soupy. Perfect week night meal. Philly Burger,LOVE IT, LOVE IT, LOVE IT!!!. Decided to make this for lunch. My family ACTUALLY liked it and they are super picky. It was quick and easy! Thanks for sharing!